ടെലിവിഷന്* എന്ന പരമ്പരാഗത മാധ്യമത്തെ ഒറ്റയടിക്ക് ഇന്റര്*നെറ്റുമായി സമ്മേളിപ്പിക്കുന്ന സങ്കേതമാണ് ഗൂഗിള്* ടിവി. ഈ സങ്കേതം ഉപയോഗിച്ചിട്ടുള്ള ആദ്യ ടെലിവിഷന്* സോണി കമ്പനി അവതരിപ്പിച്ചു. അമേരിക്കയിലാണ് ആദ്യം ഇത്തരം ടിവികള്* ലഭ്യമാവുക. ഡിസംബറോടെ ഇത് മറ്റ് രാജ്യങ്ങളിലും വില്*പ്പനയ്*ക്കെത്തുമെന്ന് റിപ്പോര്*ട്ടുകള്* പറയുന്നു. 24 ഇഞ്ച്, 32 ഇഞ്ച്, 40 ഇഞ്ച്, 46 ഇഞ്ച് വലിപ്പങ്ങളില്* നാല് മോഡലുകളാണ് സോണി ഇറക്കുന്നത്. ഇവയുടെ വില യഥാക്രമം 600 ഡോളര്* (26000 രൂപ), 800 ഡോളര്* (35000 രൂപ), 1000 ഡോളര്* (44000 രൂപ), 1400 ഡോളര്* (61000 രൂപ) എന്നിങ്ങനെയാണ്. 'ടെലിവിഷന്റെയും പൂര്*ണ ഇന്റര്*നെറ്റ് സെര്*ച്ചിന്റെയും അനുഭവം ഒരുമിച്ച് ലഭ്യമാകുന്ന ലോകത്തെ ആദ്യ എച്ച്ഡിടിവിയാണ് സോണി ഇന്റര്*നെറ്റ് ടിവി'യെന്ന് സോണിയുടെ സീനിയര്* വൈസ്​പ്രസിഡന്റ് മൈക്ക് അബാറി പറഞ്ഞു. ടെലിവിഷനെ ഇന്റര്*നെറ്റ് ബ്രൗസിങിനുള്ള ഉപകരണം കൂടിയാക്കി മാറ്റുകയാണ് ഗൂഗിള്* ടിവി ചെയ്യുക. യുടൂബ് വീഡിയോകള്* ഇനി തടസ്സമില്ലാതെ ടെലിവിഷനില്* തന്നെ ആസ്വദിക്കാം. ഇന്റല്* ആറ്റം പ്രോസസറും ഗൂഗിളിന്റെ മൊബൈല്* പ്ലാറ്റ്*ഫോമായ ആന്*ഡ്രോയിഡുമാണ് ഗൂഗിള്* ടിവിയുടെ കാതല്*. ഗൂഗിളിന്റെ തന്നെ ക്രോം ബ്രൗസറാണ് ഇതിലുള്ളത്. ലോഗിടെക്കാണ് ഗൂഗിള്* ടിവിക്കാവശ്യമായ വയര്*ലെസ് കീബോര്*ഡ് നിര്*മിക്കുന്നത്. ബില്*ട്ടിന്* ഓപ്ടിക്കല്* മൗസോടു കൂടിയ ക്യുവര്*ത്തി കീബോര്*ഡ് ഉപയോഗിച്ച് സുഗമമായി ഇന്റര്*നെറ്റ് ബ്രൗസ് ചെയ്യാന്* കഴിയും. Last edited by Baazigar; 10-16-2010 at 09:04 AM. While many people are focused on the recent launch of Google TV, there are a range of existing alternatives for people who want more than just TV on their TVs â€” or who may what to â€œcut the (cable) cordâ€� entirely. The chart below offers a short overview and comparison of the major providers and systems available in the US market. It is not intended to be definitive or exhaustive. Each product or system below requires some sort of new hardware, either a set-top box or a entirely new TV. Prices range from a low of $59 for the cheapest Roku box to well over $1,000 for the largest Sony Internet TV. This widget or app approach is very analogous to the smartphone universe and we should see that model continue to gain traction as an alternative to simply putting a browser on the big screen (as you have now with Opera on the Wii). Internet content and its presentation need to be optimized for the â€œform factorâ€� of TV and the â€œlean backâ€� experience. YouTube, for example, has developed a special â€œlean backâ€� version for this reason. Some of these systems are more â€œsocialâ€� than others (e.g., Boxee, Xbox Live). But overall the available content and degree of internet access varies widely. While I would handicap each of these providers somewhat differently and believe some have a better chance than others, itâ€™s still quite unclear which systems will penetrate the mainstream. Update: I was corrected that the Boxee Box does offer full internet access through a browser. Last edited by Baazigar; 10-16-2010 at 09:10 AM. The Logitech Revue with Google TV's Web browser offers you no more protection or control than a run-of-the-mill desktop version. Google TV becomes less mysterious every day. We now have Logitech's pricey Revue box and peripherals to fawn over. Everything looks so sleek and black. The color is fitting; it matches the darkness at the heart of this otherwise innovative product. Yes, we need a device that brings together our online, desktop, and television-viewing worlds. I want a platform that can break down barriers, with a search engine that traverses all digital mediums and brings back a single, cohesive results page. This is bliss. So why do I think it could turn into a horror show? 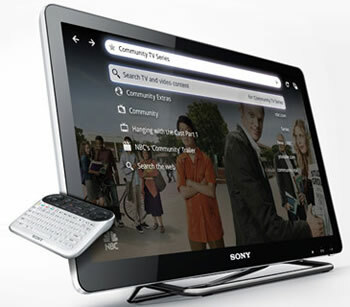 A core component of Google TV—and the Logitech Revue—is the Google Chrome Web browser. This makes perfect sense. Google has built one of the best Web browsers on the market. It's so good it's captured over 10 percent of the market in just two years. According to one Google exec I spoke to at the Logitech Revue launch event, the browser inside the device is actually Chrome 5. It will even get slipstream updates just like the Chrome browser on your desktop or laptop. In case you didn't know, Google is quietly updating Chrome for you, whether you like it or not. Surely, I thought, the browser inside the Logitech Revue with Google TV couldn't be exactly the same as a run-of-the-mill Web browser. I was right. A Google executive explained that this browser was entirely devoid of Chrome, meaning the thin interface Google wraps around the desktop version is gone. Another Google rep did tell me that Google made the UI slightly different to optimize for the TV "form factor." 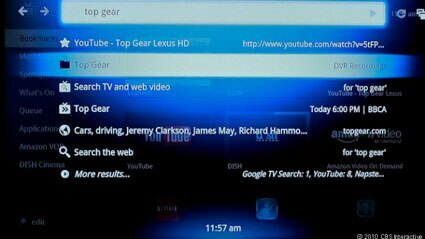 I wondered what other tweaks Google might have made to try and optimize the browser for Revue with Google TV. Wait a minute, I said to the Google exec. What if someone is operating his Revue with Google TV And he stumbles on a pop-up chain (accidentally hitting an adult site comes to mind). Does the Google TV Chrome browser do anything to suppress the pop-ups or at lease shield the user from this kind of activity? This isn't, after all, a PC. Nope, the browser doesn't do anything, because it's simply Chrome. It will protect you only in the ways Chrome on the desktop can protect you. And there's the fatal flaw. It gets worse. Remember, this Chrome browser has no interface or controls. So how do you shut it down and stop those out-of-control pop ups? How do you even change the browser settings? To be clear, it's really just a browser. Throughout the Logitech Revue with Google TV press conference, both companies repeated that mantra. When asked about commerce integration, execs said that "the whole Web is accessible" through the browser, which means, shopping sites, content sites, and everything else. If that's the case, don't you need some sort of protection from "the whole Web?" You can't install security software on Google TV, so how do you automatically block the bad stuff? To me this is more than an issue. It's a big, dark problem that literally lies at the core of Google TV. I don't understand how Google can put a browser on a device without the traditional controls of a computer and not make any kind of software adjustments. If something bad starts to happen on Logitech's Revue with Google TV, what's a user supposed to do? Shut off the TV? No, the activity will still be live and right there when you turn on your set. There are, in fact, Ctrl Alt and Delete buttons on the Revue Remote Control keyboard, so I guess you could use that to reset the box. That seems very un-TV-ish. How, though, do you clear your history and cache? Look, I'm glad Google, Logitech, and other partners are diving into this, but if they let this problem slip by, what other crucial product mistakes have they missed?